"We weren't quite ready, but we will be soon," says Bungie about its unintentional game reveal. 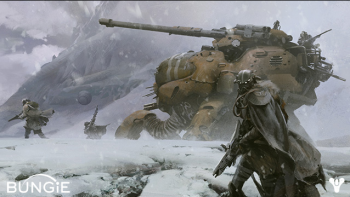 If you're wondering what the armored behemoth in the picture is, so am I, and so are we all; but it is part of the latest game from Bungie, Destiny. An unintentional reveal from a PR firm forced Bungie's hand, and though the game maker - famous for shooters Halo and Marathon - does want to talk about its game, it can't; at least, not yet. "We can't wait to finally show you what we've really been up to," said Bungie in a post on its webpage. We don't know much about Destiny yet but, if the reveal is to be believed, the story starts seven centuries from now when everything has gone to hell in a handbasket. Man has had his day, and the remains of his Golden Age can be found scattered all over the solar system. Now most people live in the Last City, trying not to die. You play as a Knight defending the last remnants of humanity against alien creatures determined to take over Earth. You're helped in this endeavor by the Traveler, a massive alien ship that hangs over the planet like a second Moon. If you were hoping I was about to tell you what platform this would be on, or even a release date, tough luck; this comes courtesy of a leaked document that Bungie didn't want out in the wild. There's loose talk that Xbox 360 and PS3 iconography - and even Xbox 720 and PS4 - is included in the PR documents, for what that's worth. Still, there's bound to be more to come. In the meantime, let the wild speculation commence!